Painted in acrylic on box canvas from sketch reference. Ireland, Summer 2012. Also available as open edition Giclée print on box canvas for £150 with certificate of authentication. Painted from sketch and photo references in my Buckland studio. 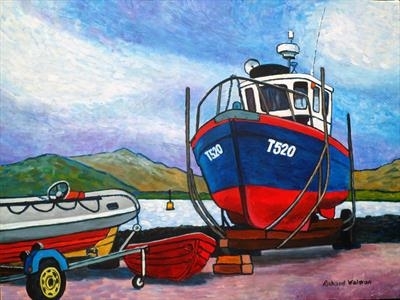 Subject is a fishing, boat on the hard, ready for difficult to afford repairs in recession and Euro hit Ireland. This qualifies as a seascape painted in acrylic on boxed, canvas. It is representational with strong red/blue colours against a landscape of harsh Irish hills and sea. It represents both the reality of living in a remote place and the beauty of boats and the sea.